New Mexico Aims To Be Fossil-Fuel Free By 2045, Despite Oil Boom New Mexico lawmakers passed a bill this week mandating state utilities use 100 percent renewable energy by 2045. Meanwhile, oil production in the southeast corner of the state is breaking records. Pumpjacks like this one dot the desert of southeast New Mexico, as oil and gas companies rush to develop one of the largest oil reserves in the world. California and Hawaii are the only other states with 100 percent carbon-free goals on the books, though a handful of other states are currently considering similar targets. Gov. Michelle Lujan Grisham, who has actively championed the legislation --going as far as to pour coffee for lawmakers before a committee hearing on the bill — is expected to sign it into law this week. Lujan Grisham made a splash soon after taking office by ordering the withdrawal of National Guard troops at the Southern border. She has made it clear that she wants to challenge the Trump administration's climate policies — or lack thereof. "This is a state that is not in climate denial," she says. "We are clear that we have basically a decade to begin to turn things around and New Mexico needs [to] and will do its part." New Mexico Gov. 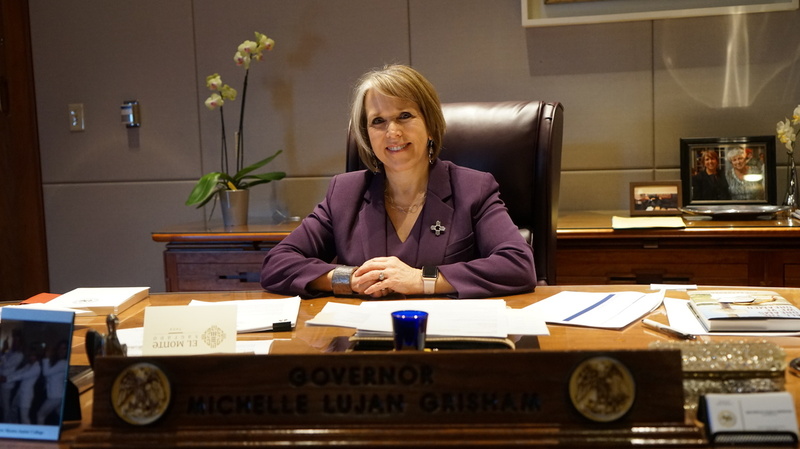 Michelle Lujan Grisham. But the legislation and push toward renewable energy sources comes at an interesting time in New Mexico. Just hours before the state's legislature passed the bill, the state Oil Conservation Division released new numbers showing that New Mexico produced a record 246 million barrels of oil last year. Most of which was exported. The record-breaking production, largely on federal lands, is being driven by an explosion of oil and gas development in the southeast corner of the state, and it's providing a windfall to the state's typically lean budget. In the immediate aftermath of the passage of the state's Energy Transition Act, environmental advocates were hesitant to do anything but celebrate what they lauded as a historic moment. Still, there are lingering concerns about the climate impact of all that fossil fuel development in the Enchantment State. Tom Singer, the senior policy advisor at the Western Environmental Law Center, says that if all of that oil and gas pulled from New Mexico is burned, it would release roughly as much greenhouse gases as twenty coal plants a year. And there's a lot of oil yet to be produced. 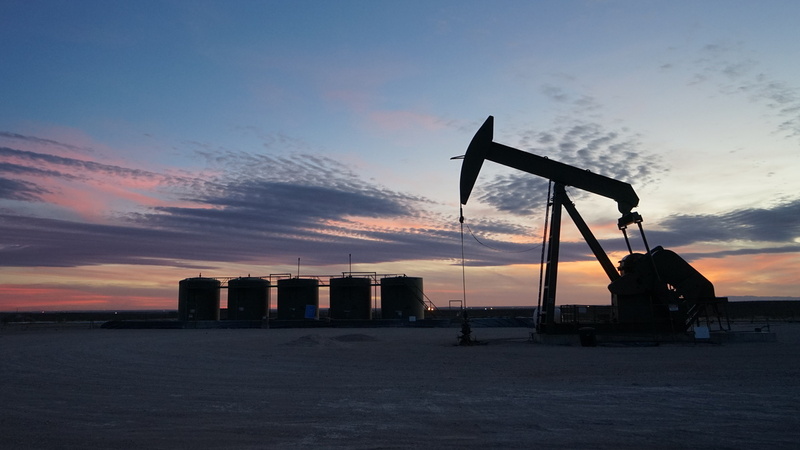 The U.S. Geological Survey recently identified the Permian Basin, in southeast New Mexico and West Texas, as the largest continuous oil and gas resource in the U.S. It contains an estimated 46.3 billion barrels of oil and 281 trillion cubic feet of natural gas. "We really can't meet the [world's] greenhouse gas climate goals that we have to meet and develop all of that oil and gas," says Denise Fort, a professor emeritus at the University of New Mexico and longtime environmental lawyer. The concurrent developments — an unprecedented oil boom and the state's landmark energy legislation — make for a "complicated moment," Fort says, with broad ramifications. "And I think a lot of people within this state are thinking about this without a very strong sense of what we should do about it." Nobody doubts that the energy legislation will significantly reduce greenhouse gas emissions within the state of New Mexico. The state currently gets more than half of it's in-state electricity from coal. New Mexico's "Roundhouse," as locals call it, has been busy during the legislature's 60-day session. By directing the state's electrical providers to move to 100 percent carbon-free energy sources in the next 25 years, with checkpoints along the way — 50 percent by 2030, 80 percent by 2040 — coal won't be a viable option much longer. That would likely have been true even without the legislation, says Rep. Nathan Small, one of the bills sponsors. "Natural gas is out-competing coal across the country and, of course, we're no different here in New Mexico," he says. Those market forces, as well as lawsuits and regulation, have led to a steady decline in coal production across the country and in the Four Corners region of northwestern New Mexico, where the San Juan Generating Station, a major coal-fired power plant, may close as soon as 2022. Parts of the legislation though, Small says, ensures that the region doesn't get left behind in the transition. It earmarks tens of millions of dollars for the clean-up of the coal-fired power plant — a point of conflict for some detractors of the bill — provides funding to help the community and affected workers, and it ensures that some of the new renewable energy development happens in the same region. Some are looking to natural gas development as a bridge fuel, but to truly get to 100 percent carbon-free, the state is going to have to phase out gas-fired power as well. That means massive investments are going to need to be made in renewable energy sources like solar and wind. Critics worry about the cost and storage, but from a supply angle, the potential is there: New Mexico's solar energy resources are among the best in the country, Small says, and the state is in the top 15 states for wind power. But Small and other lawmakers also recognize the opportunity with the state's oil and gas reserves. New Mexico is currently the third largest oil producing state in the U.S. and it has room to grow. The desert of southeastern New Mexico is now dotted with drilling rigs and bobbing pump-jacks. Quiet two-lane roads have turned into traffic-clogged thoroughfares as oil-field workers commute from a growing number of RV parks and man-camps. Folks who have seen oil booms and busts before say they've never seen anything like what's happening in the Permian now. 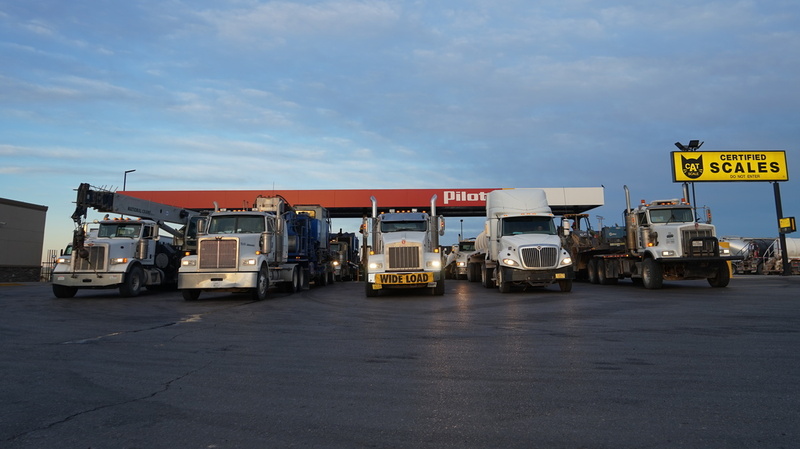 Big-rigs, destined for the oil fields, line up in the pre-dawn light at a gas station outside of Hobbs, N.M. Gas stations have had a hard time hiring enough employees to meet the demands of the oil boom. "It's crazy," says Robert Higgins, who works at an oil field supply store in Loving, N.M.
Higgins and others in southeast New Mexico disparagingly refer to the Energy Transition Act as "New Mexico's Green New Deal." There's a concern that the legislation will impact oil and gas development in that part of the state. "Killing the goose that lays the golden egg," says Wally Lester, another oil field supplier. "Or trying to anyways." 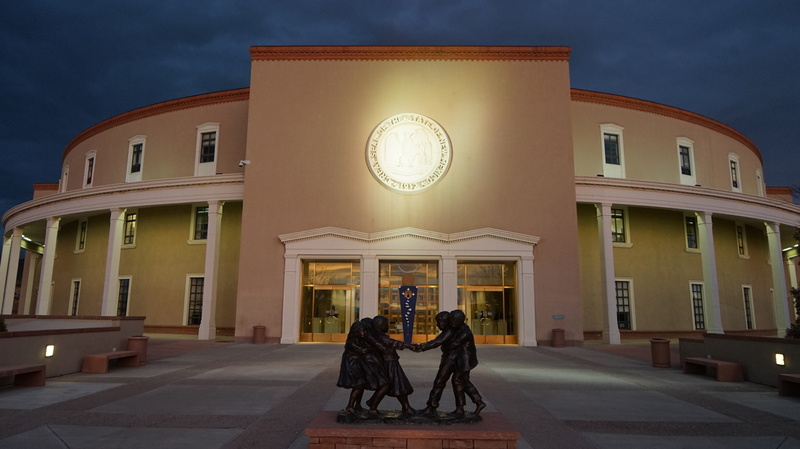 New Mexico now has a $1.2 billion budget surplus thanks to oil and gas revenues — money that's being earmarked for early childhood development and public schools. In reality though, the legislation does little to impact the oil and gas industry other than ensure that the state phases out gas-fired power as its own energy source. It does nothing to the export market, which is driving much of the development. Small, who's from Las Cruces, says many of his constituents are worried about climate change. The state is expected to experience hotter temperatures, more wildfire and increased risk of drought. But to act in the best interests of all New Mexicans, he says, the state needs to be looking at oil and gas development as part of its energy future. Gov. Lujan Grisham touts a similar line. Lujan Grisham says she wants to work with oil and gas to limit methane emissions in the oil fields and to find ways to cut down on greenhouse gas emissions during production. New Mexico, she says, can lead by setting an example for others to follow. Still, some in the environmental space worry that won't be enough. "I think at some point we're going to have to look at oil and gas exports," says Fort, but that is not likely to happen in a fossil-fuel rich state like New Mexico. "I think the social consensus that we can't afford to continue developing fossil fuels will perhaps come from a state that doesn't have so many fossil fuels."